It's no secret that I REALLY love designer Anna Maria Horner's fabric. What I love most is that when you look at some of the prints individually you may think, "meh". However, when you put them all together, what should be a hot mess ends up being an explosion of colorful awesomeness......in my opinion at least! I love to hoard my AMH, but sometimes I get really annoyed at myself for NOT using precious fabric. I decided to go all out on this quilt! I was using as much AMH as I could find in my stash--hard to find prints and all! I wanted to keep the pattern simple, but not as basic as square patchwork. I decided on the Sawtooth Star mainly because I had a new ruler I wanted to try. This is my new favorite ruler! The Flying Geese ruler! Seriously, so freaking in love with this thing! It made putting this quilt together so easy, so fast, and with virtually perfect results. I didn't have to trim one single block! I thought I'd give a brief overview on how this little guy works. I got mine at JoAnn's and they carried two sizes, 3"x6" (what I have) and 4"x8". Each ruler makes two sizes of geese. Mine will make 1.5"x3" and 3"x6". Cut two squares according to the package direction for the size geese you want to make. Place the squares rights sides together and center the smaller square on the larger one (I just folded creases in the squares to find the middle) I ended up cutting my larger square .5" larger than they suggested because it gave me more wiggle room when I went to trim the blocks at the end. 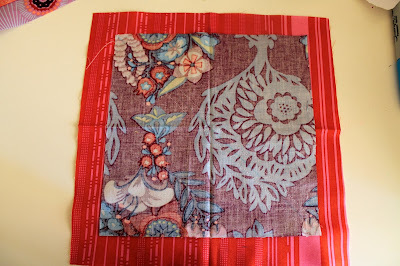 Draw a diagonal line through the smaller square and sew 1/4" on either side of the line, just like when you make HSTs. Open the resulting units and press toward the larger square. Then place the squares right sides together matching the corners, NOT THE SEAMS IN THE MIDDLE. The corners should be opposite fabrics. Draw another diagonal line and sew 1/4" on either side, then cut on the line you drew. This is the strangest step, but it's important! make a tiny snip in between the seams of each resulting unit. Don't clip through the stitches holding it together! Then, you can press the seam allowance toward the larger square fabric on each side of the unit. Trust me, this will make sense once you do it! You end up with two weird looking blocks like this. For reference, if you looked on the back of this block, my seam allowance would be clipped in the area where the tops of the red triangles meet. All seam allowances are pressed to the red fabric. Now it's time to break out the best ruler ever! This would also be a good time to bust out your rotating cutting mat if you have one. Line up the ruler to the geese on your block and trim all the way around. Ta-da! FOUR amazingly perfect geese!!!! I know these seems like a bunch of steps, but the results are perfect and you get 4 units for your effort! Seriously, I love this freaking ruler! For these blocks, I used (4) geese, (4) 3.5"squares, and (1) 6.5" square. The block is 12.5" unfinished. I love how wild and crazy this quilt turned out! It wasn't planned (a real challenge for me) and I didn't edit myself much in my fabric selection or pairing. It's my stream-of-consciousness quilt! Maybe I should rename it The Sound and the Fury quilt. Jeez, I think my nerd is showing. That high school term paper is still haunting me! Hopefully some of you got that reference! This is absolutely GORGEOUS! I also annoy myself when I don't use awesome fabric more often. How do you think you might quilt it? I absolutely love this quilt!! I have one of these rulers but I've never figured out how to use it. Now I can! Thanks. Thanks for the tutorial on the ruler, I may have to run to Joanns and grab one or both of these. I try to do quilt notion reviews for my blog and I am always looking for interesteing things to review. I have taken the whole summer off from posting though, so I need to work on getting back into the swing of things! Thanks again! First I absolutely love your quilt and the fabrics! And I have seen the rulers at JoAnn Fabrics, but didn't think I would ever use it. I am now going to the recycling bin for the JoAnn coupon that I just threw out figuring I should just stay away from that place for a while. I think you have changed my mind. I have one of these ruler that I haven't opened yet and a star baby quilt that needs to be made soon...kismet! Thank you for the tips and I absolutely think your AMH quilt is stunning! I love, LOVE this quilt!! So vibrant! And thank you for the tutorial on this ruler. I bought this ruler this summer (at JoAnn's! My first visit there!) just because it was there and it seemed handy... I will keep this tutorial for when I want to use it! I am a AMH lover too! I love it so much, I rarely use it! I admIre your bravery! Your quilt turned out beautifully! 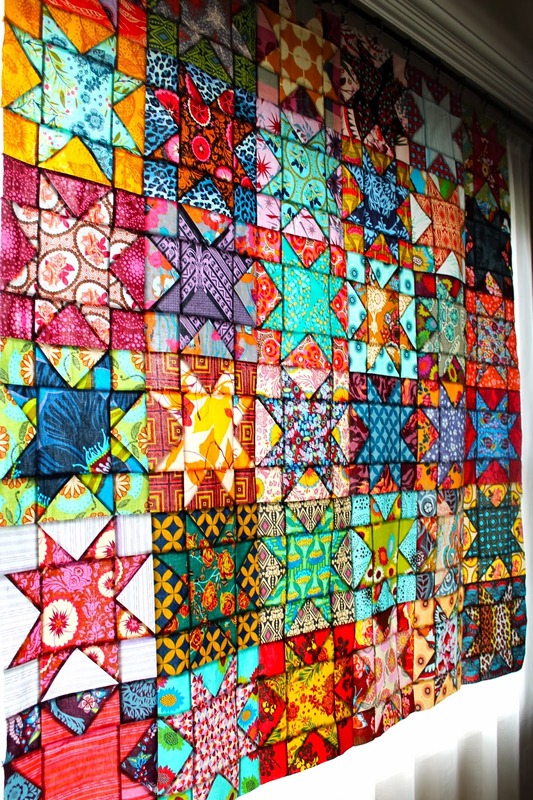 I'm not a *huge* individual fabric AMH fan (although some steal my heart) but you are right at how amazing this quilt looks! Wow, this is awesome! Really, really awesome. I love that the colors don't make sense (like the pairings you made don't make "sense" to me as usual pairings), yet the overall effect so totally works. Really fabulous! I just want to jump up and copy you! Also, that ruler DOES look good. Thanks for showing us how it works. Sawtooth stars are something I've been meaning to make soon. Great quilt! How much of each fabric did you use? I have a stack of fat quarters that I would like to use!